What is this weird Twitter army of Amazon drones cheerfully defending warehouse work? Home → Social Media → What is this weird Twitter army of Amazon drones cheerfully defending warehouse work? Here is a strange little online community to puzzle at. 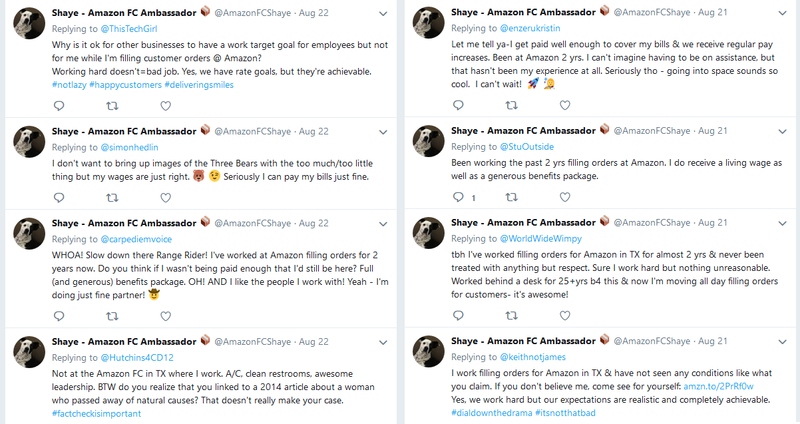 Amazon has developed an unnerving, Stepford-like presence on Twitter in the form of several accounts of definitely real on-the-floor workers who regurgitate talking points and assure the world that all is right in the company’s infamously punishing warehouse jobs. After Flamboyant Shoes Guy called out the phenomenon, I found 15 accounts (please don’t abuse them — they get enough of that already). All with “Amazon smiles” as their backgrounds and several with animals as profile pictures. All have the same bio structure: “(Job titles) @(warehouse shorthand location). (Duration) Amazonian. (2- or 3-item list of things they like. )” All have “FC Ambassador ” in their name. All have links to an Amazon warehouse tour service. Hello! I work in an Amazon FC in WA and our wages and benefits are very good. Amazon pays FC employess ~30% more than traditional retail stores and offers full medical benefits from day 1. Working conditions are very good- clean/well lit- Safety is a top priority at my facility! Did you know that Amazon pays warehouse workers 30% more than other retailers? I feel proud to work for Amazon – they've taken good care of me. Much better than some of my previous employers. On the contrary, we Amazon employees get paid very well. In fact Amazon pays fulfillment center employees ~30% more than traditional retail stores. On top of that we also get full health benefits that includes dental & vision! I almost forgot to mention…we also get stocks! The workers say that they don’t receive compensation for being ambassadors; it’s a “totally optional role” they have taken on voluntarily (Update: turns out they are paid to do this). They also claim to be warehouse employees in the ordinary sense. If so, they’re putting their numbers at risk by taking the time out to bang out long tweets hourly on how great they’re doing. Their most frequent topics of conversation are how they get bathroom breaks, the pleasant temperature of the warehouses, the excellent benefits and suitable wages, friendly management and how the job isn’t monotonous or tiring at all. FC Ambassador Carol, for example, is downright elated to be a picker, and is clearly a Bezos admirer. I love "couch shopping!" It's ALMOST as much fun as being here at work in the FC. As a picker, we get to see all the unique things people purchase. It keeps the night interesting, waiting to see what is going to come across my screen next. Amazon has really developed into something pretty amazing since it's start in 1994. And I, for one, am sure glad it did. I have been with the co just over a year, now and wouldn't trade my time in the FC for anything. I can safely say that none of MY ideas have panned out anywhere near what Jeff Bezos has accomplished. I am more than happy, though, to continue working here, at BFI4, in WA. I receive a (more than fair) wage and work with some really good people. Making history, every day. You can practically hear the smile on her face. I have a friend who worked as a picker for a while, admittedly some years back. He said it was some of the most mind-numbing yet physically demanding work he’s ever done. I understand that some folks may just be happy to have a job with full pay and benefits — I’d never begrudge anyone that, I’ve sure felt that — but the unanimous and highly specific positivity on display in these ambassador accounts really seems like something else. It’s no secret, after all, that Amazon has an image problem when it comes to labor. Reports have for years described grueling labor at these “fulfillment centers,” where footsore workers must meet ever-increasing daily goals, their time rigidly structured and room for advancement cramped. Just recently Gizmodo’s Brian Menegus has had a couple of great stories on current — not past — labor conditions at the company, and of course there have been dozens of such stories detailing exploitation or generally poor conditions over the last few years. And not just here in the U.S., either. I’ve asked Amazon for more details on what this program really consists of, and how it comes to pass that warehouse workers are being not paid to monitor Twitter, regularly rebutting critics with clearly canned stats and the kind of forced humor one would imagine they would indulge in if their overalls hid a shock collar. I’ll update this post if I hear back. And yes, they are paid to do this. Being an “FC ambassador” is a full-time job, it seems. I’ve asked for further details, since the ambassadors seem to imply they do this just as a bit of extra responsibility at their regular job because they like teaching others so much.